Become a “Student Buddy” for international students! Become a “Student Buddy” and help international students to adapt to RISEBA study environment. 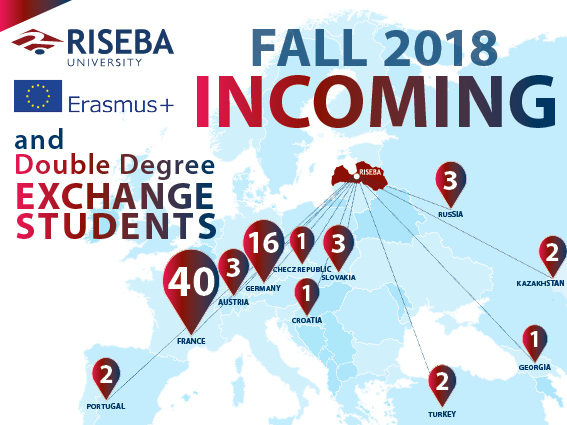 Each year RISEBA welcomes new international students, who have chosen to study in Latvia within the scope of the Erasmus+ and Double-degree exchange programme. In study year 2018/2019 74 students from 11 different countries – France, Germany, Austria, Turkey, Slovakia, Georgia, Portugal, the Czech Republic, Croatia, Russia and Kazakhstan – will arrive and start their studies at RISEBA University. To help new students to adapt in Latvia and RISEBA University study environment, to understand requirements and traditions of the university, to provide support and give answers when necessary, RISEBA invites to become a friend to international students – a “Student Buddy”. It is a great opportunity not only to gain new intercultural experience and improve language and communication skills, but also to make new friends.